Simplilearn's Data Scientist Master’s Program will help you master skills and tools like Statistics, Hypothesis testing, Clustering, Decision trees, Linear and Logistic regression, R Studio, Data Visualization, Regression models, Hadoop, Spark, PROC SQL, SAS Macros, Statistical procedures, tools and analytics, and many more. The courseware also covers a capstone project which encompasses all the key aspects from data extraction, cleaning, visualisation to model building and tuning. These skills will help you prepare for the role of a Data Scientist. 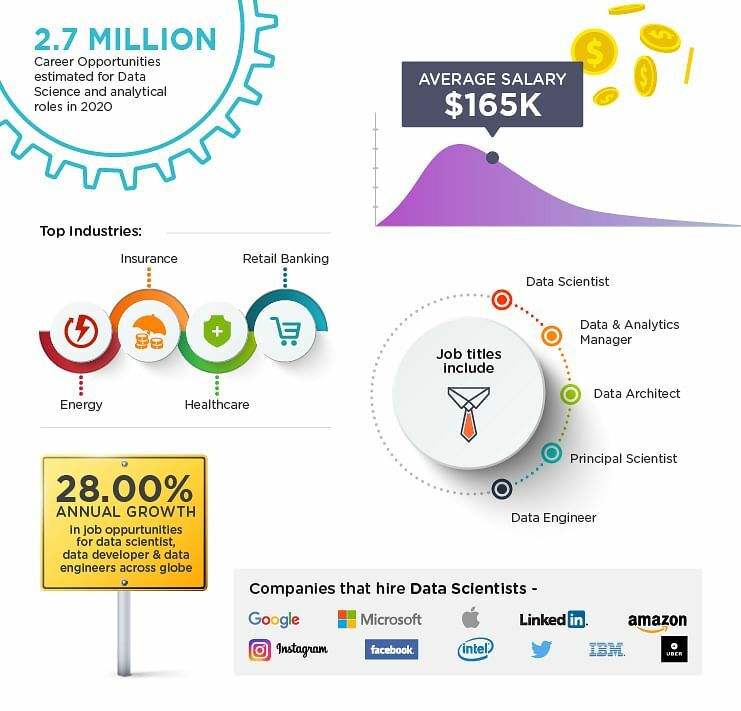 Data scientist is the pinnacle rank in an analytics organization. Glassdoor has ranked data scientist first in the 25 Best Jobs for 2016, and good data scientists are scarce and in great demand. As a data scientist you will be required to understand the business problem, design the analysis, collect and format the required data, apply algorithms or techniques using the correct tools, and finally make recommendations backed by data. Description: You will go through dedicated mentored classes in order to create a high-quality industry project, solving a real-world problem leveraging the skills and technologies learnt throughout the program. The capstone project will cover all the key aspects from data extraction, cleaning, visualisation to model building and tuning. You also get the option of choosing the domain/industry dataset you to want to work on from the options available. After successful submission of the project, you will be awarded a capstone certificate that can be showcased to potential employers as a testament to your learning. Description: Comcast, one of the US-based global telecommunication companies wants to improve customer experience by identifying and acting on problem areas that lower customer satisfaction if any. The company is also looking for key recommendations that can be implemented to deliver the best customer experience. Description: IBM, one of the leading US-based IT companies, would like to identify the factors that influence attrition of employees. Based on the parameters identified, the company would also like to build a logistics regression model that can help predict if an employee will churn or not. Project 4: Predict accurate sales for 45 stores of Walmart, one of the US-based leading retail stores, considering the impact of promotional markdown events. Check if macroeconomic factors like CPI, unemployment rate, etc. have an impact on sales. Description: Walmart runs several promotional markdown events throughout the year. The markdowns precede prominent holidays, such as the Super Bowl, Labour Day, Thanksgiving, and Christmas. The weeks including these holidays are weighted five times higher in valuation than non-holiday weeks. The business is facing a challenge due to unforeseen demand, resulting in stocks running out at times due to inaccurate demand estimation. The macroeconomic factors like CPI, Unemployment Index etc. also play an important role in predicting the demand, but the business hasn’t been able to leverage these factors yet. As a part of this project, create a model to highlight the effects of markdowns on the holiday weeks. Project 5: Learn how leading Healthcare industry leaders make use of Data Science to leverage their business. Description: Predictive analytics can be used in healthcare to mediate hospital readmissions. In healthcare and other industries, predictors are most useful when they can be transferred into action. But historical and real-time data alone are worthless without intervention. More importantly, to judge the efficiency and value of forecasting a trend and ultimately changing behaviour, both the predictor and the intervention must be integrated back into the same system and workflow where the trend originally occurred. Project 6: Understand how the Insurance leaders like Berkshire Hathaway, AIG, AXA, etc make use of Data Science by working on a real-life project based on Insurance. Description: Use of predictive analytics has increased greatly in insurance businesses, especially for the biggest companies, according to the 2013 Insurance Predictive Modeling Survey. While the survey showed an increase in predictive modelling throughout the industry, all respondents from companies that write over $1 billion in personal insurance employ predictive modelling, compared to 69% of companies with less than that amount of premium. Project 7: See how banks like Citigroup, Bank of America, ICICI, HDFC make use of Data Science to stay ahead of the competition. Project 8: Learn how Stock Markets like NASDAQ, NSE, BSE, leverage on Data Science and Analytics to arrive at a consumable data from complex datasets. Description: As a part of the project, you need to import data using Yahoo data reader of the following companies: Yahoo, Apple, Amazon, Microsoft, and Google. Perform fundamental analytics including plotting closing price, plotting stock trade by volume, performing daily return analysis, and using pair plot to show the correlation between all the stocks. Project 9: See how Data Science is used in the field of engineering by taking up this case study of MovieLens Dataset Analysis. Description: The GroupLens Research Project is a research group in the Department of Computer Science and Engineering at the University of Minnesota. The researchers of this group are involved in many research projects related to the fields of information filtering, collaborative filtering, and recommender systems. 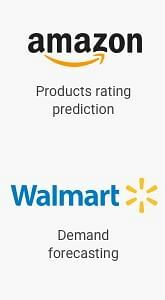 Project 10: Understand how leading retail companies like Walmart, Amazon, Target, etc make use of Data Science to analyze and optimize their product placements and inventory. What type of jobs are ideal for data science trained professionals? Simplilearn is the best online platform. I have completed Data Scientist certification from here. The trainers are very knowledgeable. It has a well-organized course. The method of presentation is really commendable. Kudos to Simplilearn. It's definitely going to be a long journey for Simplilearn. Simplilearn is an awesome online training platform. I strongly suggest Simplilearn because of the depth of knowledge the trainers have. The certification helped me get promoted to Data Analyst from Quality Analyst along with a 50% hike in my salary. LEARN WITH SIMPLILEARN. I am very happy with the training I received from Simplilearn. All the sessions were well planned and executed to perfection which helped me obtain comprehensive knowledge and right skills for the Data Science Field. I am now confident that I will have stellar professional growth. 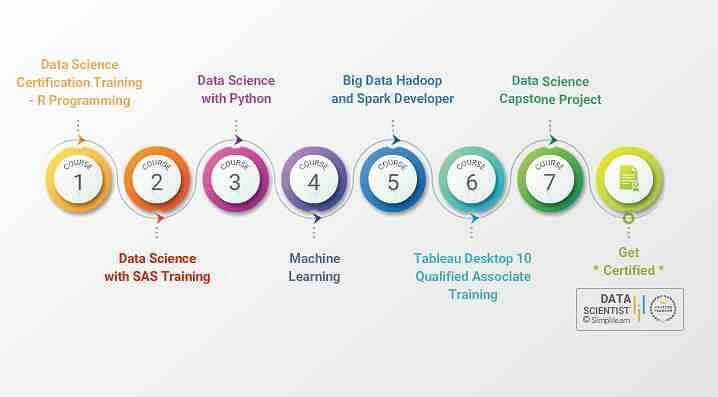 I have enrolled for Masters in Data Science with Simplilearn. The course is very well designed and perfect for working professionals. The online classroom is interactive and very well managed. Even though I am from a non-technical background, I could easily understand the course material. The faculty is friendly and they are extensively experienced in the field of Analytics. The Q&A at the end of chapters is something I especially loved as it gave me a thorough understanding of the topics taught and helped me refresh the concepts well. The support system is very efficient and will be there to help you out round the clock. Thanks to Simplilearn for providing such a great learning experience and revitalizing my work life. The Data Scientist certification program from Simplilearn was a great experience. The Ebooks and online LMS videos made the course material easy to understand. The trainer was knowledgeable and he related real-life incidents associated with this course which I think was a great idea. I could download the instructor-led class recordings and go back to listen to them anytime. The certification helped me gain deeper expertise in this domain and provided me the platform to understand the concepts and to perform better in my daily work. This course is designed for students and working professionals and is relevant and updated. The instructors are extensively experienced in the field of analytics. They use current examples and complex problems at work to explain key concepts; this makes every class lively and interactive. I work for a retail client and my team works with large sets of data. I am able to apply the knowledge gained from this training to work on these datasets and generate useful insights for my clients. These insights are used to power business decisions for my clients' companies. Thanks to Simplilearn for providing a great learning experience and refreshing my career. I always had a passion for data science and wanted to build my career in this domain. Simplilearn’s Data Scientist training helped me to acquire the skills I needed and their JobAssist program helped me to enhance my career from Programmer Analyst to Software Engineer with a salary hike. Simplilearn's training material and methodology to deliver training are top notch. While training is aimed at beginners/intermediate level but it's great for people who are un-initiated in data science and statistics. It provides a solid foundation on which one can build up quickly. Very well experienced and knowledgeable trainers who try to emulate classroom behavior among participants in the virtual training delivery setup. Best value for money and worth a experience. I have taken up Simplilearn’s Data Scientist Master’s course and the training materials like online self-learning videos, practice tests, end-of-chapter quizzes, etc are remarkably good. The trainers are friendly and ever-willing to resolve your queries. The most impressive feature provided by Simplilearn is that that they provide you with all the class recordings so you can revisit them whenever you want to brush up your concepts. Kudos, Simplilearn! Course material is really helpful. The support team is awesome and very helpful in clarifying the doubts. Thank you Simplilearn. Simplilearn has a good collection of online courses. Data Scientist certification helped me in achieving my career growth and up-skills my knowledge. Keep on adding more courses and trainers. Keep it up!!! It was a great learning experience with Simplilearn. They offer great courses with both online and interactive lectures. Overall the learning was very simple, as the name says Simplilearn. Great faculties and customer service to adhere your queries and concerns quickly. I would highly recommend Simplilearn. I have enrolled with Data Scientist Course and find its content really good. The classroom sessions provide you with ample opportunities to get your queries clarified and the offline contents give you a good understanding of the subject. Simplilearn also has an online lab wherein you can practice your newly learned concepts and discuss it with the instructor in your subsequent classes. Overall SImplilearn is a great learning platform. I have enrolled in Data Scientist Master course from Simplilearn. They have awesome study material and the trainers available for online classes have in-depth knowledge about the topic. They helped to clear doubts as and when needed. Besides, their cloud lab is quite a place worth practicing the concepts which are taught in the class. What makes this course awesome is that it is flexible and you can complete at your own pace. The course content for the Data Scientist Program is impressive, and the sessions are conducted by well-trained and knowledgeable instructors. The Tech support team is always available to assist you. Great going, Simplilearn! What is the iimjobs.com Pro-Membership plan? The iimjobs.com Pro-Membership offers learners exclusive features that aren’t available to free members. Dedicated career expert from IIMJobs will completely handhold learner to register on the portal, provide them tips and guidance to improve the profile and follow right keywords etc. Access to "Insights" - Which helps them compare their application against other applications received for a similar job. Improved visibility of your profile, your application gets promoted to the top of the applications. Receive notification if recruiter shortlists your application, you can chat with the recruiter directly and do the follow-ups on the application. What is the eligibility criteria to participate in the JobAssist Program? I am a Fresher, Can I participate in the JobAssist Program? Any graduate who has successfully completed our Master Programs will be eligible to participate in the JobAssist Program. 1+ years of experience is however recommended. Can I choose not to take this JobAssist Program and get a discount? No, the JobAssist Program is a supplementary offering which comes along with the Master Programs. It will make your chances high to get hired by the top companies. How long will this service be active for? This service will be active for a period of six months from your certification date. Is this live training or will I watch pre-recorded videos?Are the training and course material effective in preparing me for the Data Scientist exam? If you enrol for self-paced e-learning, you will have access to pre-recorded videos. If you enroll for the online classroom Flexi-Pass, you will have access to live training conducted online as well as the pre-recorded videos. How do I enroll for the Data Scientist Master’s Program? Once the online payment is completed, you will automatically receive a payment receipt and access information via email. Where and how do I access the eLearning content for the course? Once you have registered and paid for the course, you will have 24/7 access to the eLearning content on our website for a full 365 days. You will receive a course purchase confirmation receipt by email that will guide you through the process of our Data Scientist Master’s Program. I am not able to access the online course. Whom do I contact? Please submit a request through Help & Support. You can also use our chat function for an instant solution. Yes. We provide a 7-day money-back guarantee for our master&rsquo;s programs. Refer to the <a href="https://www.simplilearn.com/terms-and-conditions#/refund-policy" class="caption-dark">Refund Policy</a> and submit refund requests through our Help &amp; Support link. Once you complete the following requirements, you will be eligible to receive the Data Scientist Master’s Program certificate that will validate your acquisition of a data scientist's skillset.For the elective courses, course completion certificate and project certificate are not required. 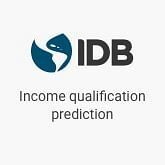 Are the training and course material effective in preparing me for the Data Scientist exam? Yes, Simplilearn’s training and course materials guarantee success with the Data Scientist certification exam.